For us, here in the UK, we are almost at the end of the school year. Consequently, I have a to-do list as long as my arm, and included on that list is the Teachers appreciation gifts. I’m sure everyone has different thoughts on these gifts, but mine are as follows; I don’t want to spend a load of money. It’s the kids who should be putting the majority of the effort into making them. And of course, I want them to look gorgeous, and for the teachers to feel fabulously appreciated! 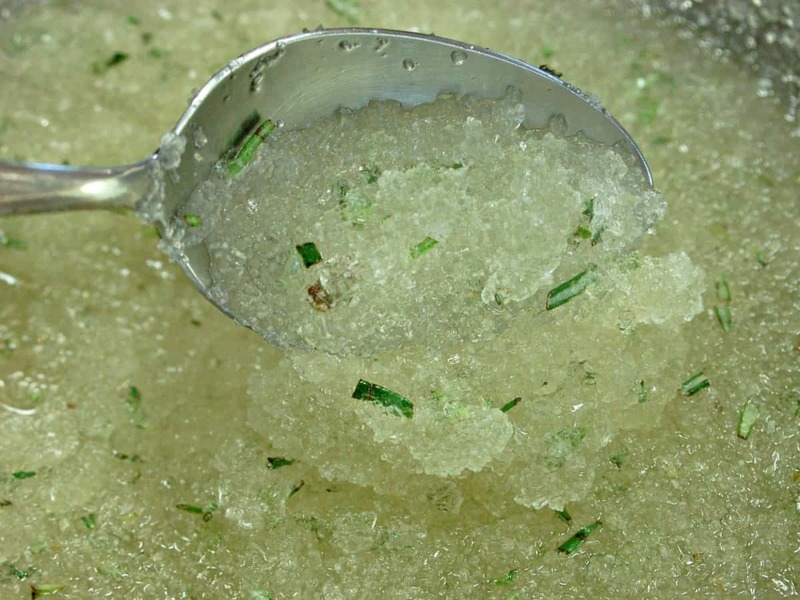 Our peppermint foot scrub meets all these requirements, and the basic recipe can be used to make any scrub you can think of. This recipe is endlessly adaptable. You can use Epsom salts, sea salt, sugar or a mix. You can use any number of oils and fragrances, and you can add in dried herbs or fresh. I imagine our teacher’s feet to be both hot and tired at this time of year, so have chosen something that I hope to be relaxing, refreshing and restorative! If you would like some inspiration on herbs to use in your scrubs check out our 21 botanicals that are fabulous for your skin. Just throw in the rest of the ingredients. How dry or oily you make your scrub is a matter of your own personal preference. As this is going to be a peppermint foot scrub, I think it’s nice to have it quite wet with oil to really encourage the user to massage it in thoroughly. Give everything a thorough mix, and spoon into pretty little jars. Then decorate with a pretty gift tag and ribbon. For some more home-made bath goodies that also make fabulous gifts, please check out our Herbal Bath Tea Bags and our Home-made Bath Fizzes. 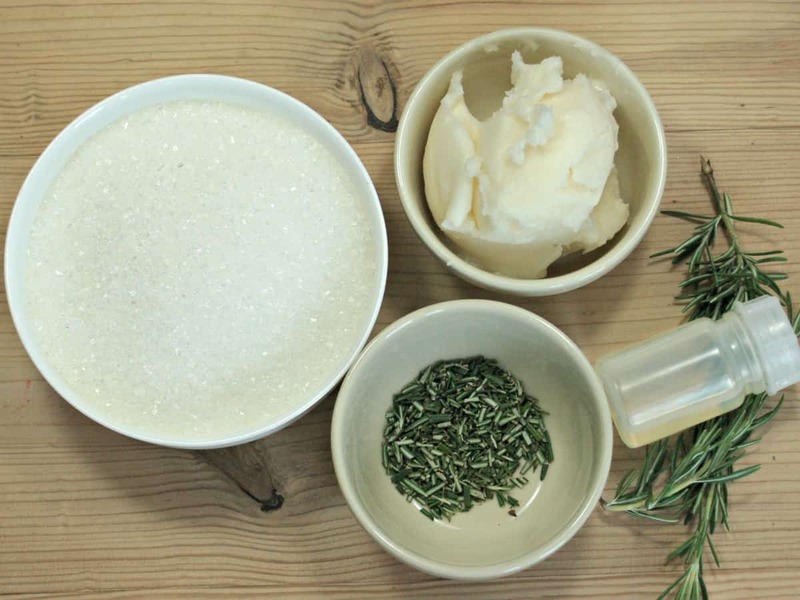 If you have enjoyed this tutorial on how to make Rosemary and Peppermint Foot Scrub, please share so others can enjoy it too. Hi! Can I use peppermint extract instead? This sounds lovely. How long does it keep for and what’s the best way to store it? Thanks, looking forward to making this for gifts. Hello cook lbs I use real mint instead of essential oil? hi! how many 3-4 oz containers do you think this recipe will make? 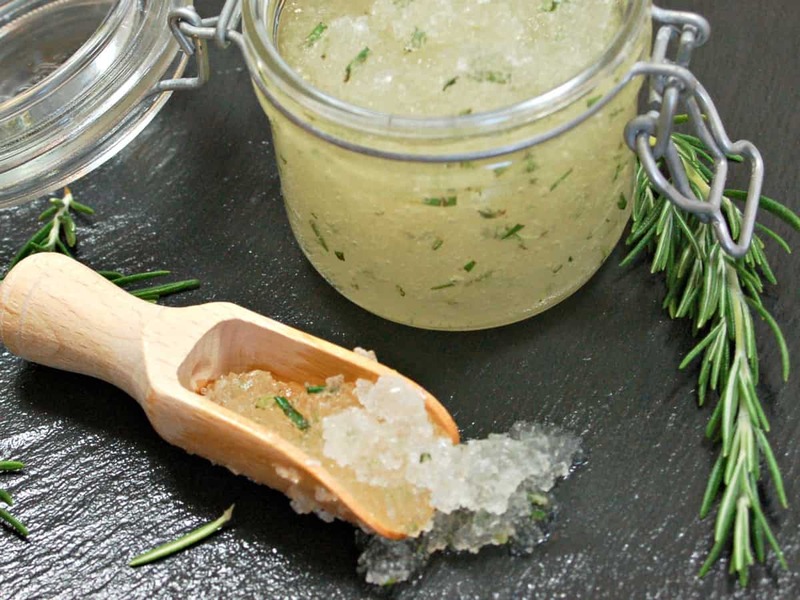 It’s a lovely scrub Victoria – let me know what you think if you try it! What a great idea! 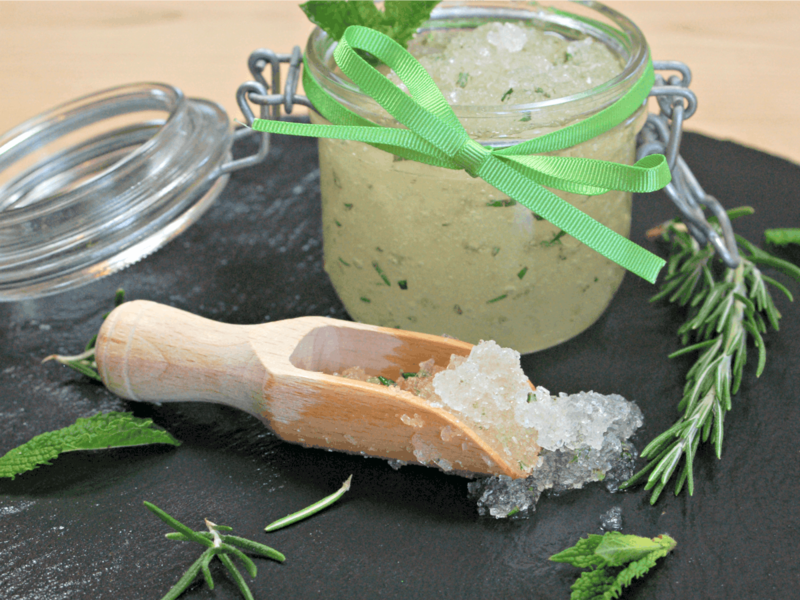 Herbs are such a great way to add a relaxing, aromatic scent to a foot scrub. Yet another reason for me to start my herb garden this year!! Oh, I bet this has a wonderful aroma! Pinned. Thanks for joining us at Social Boost Monday, Sarah. I have a rosemary bush and love the smell – sometimes as I walk past I touch it just to have its fragrance on my hands. Great recipe! This would make a brilliant and thoughtful gift! Though at first glance, I thought it was a nice icy drink! It is that pretty! I love your photos. I am bookmarking this page, especially when I need a gift for that person who seems to have everything. Wow – what a fantastic idea. The end result looks heavenly and SO professional! Well done you, and lucky old teachers to have you as a parent at their school! These look so gorgeous, they are making me hungry just looking at them. This is such a good idea for homemade gifts. It never would have occurred to me that it was so easy to make homemade scrubs! It really does sort out your feet – Mine were fab last summer for the first time ever! It’s gone down really well with everyone that we give it to. We actually saw a similar one in a gift shop and it was priced at well over £20! I checked the ingredients on the back and decided our recipe had far nicer ingredients too! We’ll be making loads again to give away at Chrsitmas, am thinking about spice combinations which would work well for that – maybe orange and ginger? This looks fantastic! And it’s very generous of you to make such a sweet gift for your children’s teachers, I’m sure they appreciated it! Will keep this idea for another Christmas I think. Thanks for your kind comment. It is a lovely, simple DIY and works brilliantly!